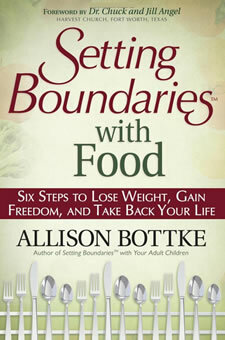 Setting Boundaries with Food is the fourth book in the Setting Boundaries™ series created by Allison Bottke. In addition to being an author she is the founder of the SANITY Support Group based on her books. This edition focuses on our relationship with food and the struggle against obesity, which is a problem affecting 68 percent of adults. Instead of dieting and rigorous exercise regimens, she encourages readers to heal their relationships and strengthen their connection with God. Bottke has endured a personal struggle against obesity where at one stage her weight was over 300 pounds. She has since lost 120 pounds and has maintained that loss for over ten years. According to her, we place an unnatural attention on food when we use deprivation and reward to try to lose weight. We try to make the food behave instead of changing our own behavior. This program replaces the focus on food with a more holistic view of the true cause of weight problems. The foundation of Bottke’s approach to permanent weight loss are her SANITY steps. Instead of dieting and depriving yourself you will focus on creating a healthy relationship with food, yourself, others and God. S – Stop your own destructive patterns. A – Assemble a support group. N – Nip excuses in the bud. I – Implement a plan, define your boundaries. T – Trust the voice of the Spirit. Y – Yield everything to God. Bottke asserts that overeating isn’t just bad for us it is also morally wrong because our character should reflect Christ. Included throughout the book are quotes from the scriptures offering guidance on how to live. Readers are encouraged to pray for insight and to ask God to help clarify their life purpose. There is no specific food plan however you should avoid processed and fried foods. You are encouraged to choose fresh, whole nutritious items and to consume smaller portions. You can eat three healthy meals a day along with several healthy snacks. Bottke recommends obtaining the majority of your calories from protein and limiting your intake of sugar and carbs. You should also eat slowly, chew your food well and take a daily multivitamin. It is important to tune into your hunger and learn how to separate food from feelings. Become aware if you are using food as a false boundary to avoid acknowledging painful emotions. Organic yogurt, berries, avocado, spinach, broccoli, zucchini, rosemary, cayenne, ginger, mustard, parsley, anise, bay, cinnamon. Readers are advised to try to exercise for thirty minutes a day at least five times per week. Setting Boundaries with Food: Six Steps to Lose Weight, Gain Freedom, and Take Back Your Life retails at $12.99. Appeals to readers of the Christian faith. Advocates a high intake of protein, which can reduce appetite. Addresses the psychological factors involved in weight gain. Encourages a permanent solution for overeating and obesity. Does not provide a meal plan or adequate advice on what to eat. Author is not qualified in the field of nutrition. References to Satan and the “sin of gluttony” will probably alienate readers who are not Christians. Setting Boundaries with Food attempts to help readers overcome obesity by healing their relationships and deepening their connection with God. This program will appeal to Christians who want to address the underlying causes of emotional overeating. Gaining greater awareness and control of your emotions and eating behaviors can result in a permanent weight loss solution.